There have been times, within several articles, that I have used the phrase "sin is exceedingly sinful." It's actually not a new idea that sin is truly and abundantly sinful. Paul expressed the idea in Romans. He writes, "Did that which is good (the Laws of God He gave to Moses), then, become death to me? Certainly not! But in order that sin might be exposed as sin, it produced death in me through what was good (the Laws of God He gave to Moses), so that through the commandment sin might become utterly sinful" (Romans 7:13, in bold for emphasis). So how do I get this idea from those five words that sin is exceedingly sinful? There are two words in the Greek Paul uses, and they are καθ’ ὑπερβολὴν (kath' hyperbolēn). The definition for the Greek pronounced as kat-ah, in the way Paul uses it means "beyond." While the other word hoop-er-bol-ay' means "in excess, surpassing excellence, exceedingly." So, Paul is saying that sin is beyond excess, or another way to put it is "sin is exceedingly sinful." Why is this important to know? Paul just got finished about the merits of the Laws of God given to Moses being a holy and just instrument in showing just how sinful doing a particular action was. Paul tells us, "What then shall we say? Is the Law sin? By no means! Indeed, I would not have been mindful of sin if not for the Law. For I would not have been aware of coveting if the Law had not said, "Do not covet." But sin, seizing the opportunity through the commandment, produced in me every kind of covetous desire. For apart from the Law, sin is dead" (Romans 7:7-8, Berean Study). Paul also goes on to say, "Once I was alive apart from the Law; but when the commandment came, sin sprang to life and I? dead. So I discovered that the very commandment that was meant to bring life actually brought death. For sin, seizing its opportunity through the commandment, deceived me and through the commandment put me to death. So then, the Law is holy, and the commandment is holy, righteous and good" (Romans 7:9-12). I'm camping out here in Romans, for the moment, to show why it is we need Jesus Christ as Lord and Savior. What the Law cannot do, bring life, actually in Paul's argument brings a life of sin, death, and becomes exceedingly bad for us. In a moment we read from Paul's hand, "I know nothing good lives in me, that is, in my flesh; for I have the desire to do what is good, but I cannot carry it out. For I do not do the good I want to do. Instead, I keep on doing the evil I do not want to do. And if I do what I do not want, it is no longer I who do it, but it is sin living in me that does it" (Romans 7:18-20). In the preceding verses between thirteen and eighteen Paul writes: "We know that the Law is spiritual, but I am unspiritual, sold as a slave to sin. I do not understand what I do. For what I want to do, I do not do. But what I hate, I do. And if I do what I? do not desire, I admit that the Law is good. In that case, it is no longer I who do it, but it is sin living in me that does it" (Romans 7:14-17). What we see is since Paul said this one thing twice it matters to us to take serious note that sin, within us, corrupts the desires we longingly care to do, but because God's Law is on our hearts it isn't a natural course of action to do what's right; it is sin within us, our flesh, that wages war against the things of God, such as His Spirit. God desires to give us His Spirit. For some of us God knows the condition of our hearts. He comes to us then and He shows us how sin has made us targets for death and His condemnation. Paul says here in Romans, "This is the principle I have discovered: When /i want to do good, evil is right there with me. For in my inner being I delight in God's Law. But I see another law at work in my body, warring against the law of my mind and holding me captive to the law of sin that dwells within me." He then adds this on: "What a wretched man I am! Who will rescue me from this body of death? Thanks be to God, through Jesus Christ our Lord! So then, with my mind I serve the law of God, but with my flesh I serve the law of sin" (Romans 7:21-25). We are made to be spiritual beings alongside God. That's how God intended for mankind to be. But when Satan, the accuser of the brethren came to Adam and Eve in the Garden, he spoke to a side of Eve that "desired to know good and evil," it's why when she looked again at the fruit on the tree of knowledge of good and evil (the tree she was told not to touch and take the fruit thereof) sin came alive. Remember God's command to them both? "And the LORD God commanded the man, saying, "Of every tree of the garden you may freely eat; but of the tree of the knowledge of good and evil you shall not eat, for in the day that you eat of it you shall not surely die" (Genesis 2:16-17, New King James). God was telling both Adam and Eve that what would happen was that they weren't just going to physically die, but their condition from Him would be cut off. Notice Paul's words in Romans 7, "I am unspiritual" (Romans 7:14). So, how do we get to being spiritual? Does God somehow put eternity on our hearts, speaking to us in our sinful state, calling us to obey and follow after Him? I would have to say yes to this. If we go back to the Creation account man was separated from God after the initial sin of Adam and Eve. And yet God does this thing, He comes and talks to a man named Abram. Right before we see God calling and talking to Abram, we see a record of humanity and also a genealogy leading to Abram in Genesis 11. We read this, "Terah took his son Abram, his grandson Lot (Haran's son), and his daughter-in-law Sarai, his son Abram's wife, and they set out together from Ur of the Chaldeans to go to the land of Canaan. But when they came to Haran, they settled there. Terah lived 205 years and died in Haran" (Genesis 11:31-32, Holman Christian Standard). And then in the beginning of Genesis 12 we see God calling out to Abram, saying, "Go out from your land, your relatives, and your father's house to the land I will show you" (Genesis 12:1). He didn't say, "Take your nephew Lot with you. Abram took Lot with him on his own accord. Apparently, God saw something else other than sin in his life to warrant God speaking life into Abram, to get Abram to be obedient to Him. For we read a few short verses later, "So Abram went, as the LORD had told him, and Lot went with him. Abram was 75 years old when he left Haran" (Genesis 12:4). If God has called out to you, while you have been dead in sin and trespasses against Him, it's because He's seeing something deep in your heart that you want nothing to do with. God will always speak to those who reckon themselves of little to no worth. They look at the sin in their lives and say, "No more!" They turn from their sin and sinful ways. It's a bit like the Prodigal Son, in Luke 15. He sees himself in the muck and mire of the pig pen and he says, "You know I can eat far better than eating the pods these pigs are eating. Yes. I will go home, and make myself a servant of my father. I desire nothing else than to be cared for by my father. 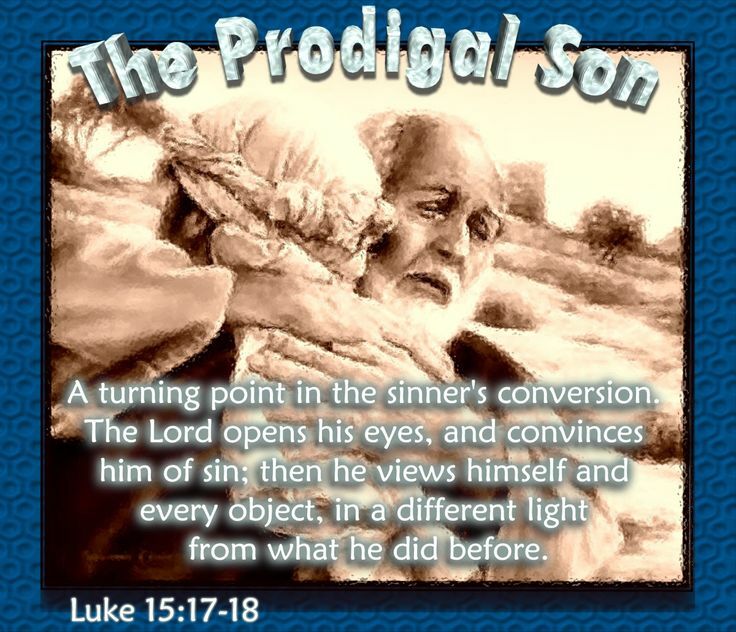 I have sinned against him and heaven" (see Luke 15:17-20). What I wanted to show in this article is simply this: sin is at the core sinful. We don't have to live within the confines of ourselves, in the flesh, acting out against our heavenly father who desires to lavish the very best on us. But we have to reckon ourselves of no use. We have to be willing to be humbled, to see things as they are within the light of who God is. He is holy and just and His desire isn't just to see us being holy, but that He alone can do it. Jesus Christ said, "I am the way, and the truth, and the life: no man comes to the Father, but by me" (John 14:6). It means there are no other roads, no other routes. No other religion will get you to God. No path gets you to the Father, only through Jesus can you come to the Father. Friend, if you're reading this right now, and you have it in your heart to pray and call out to God to ask His forgiveness, use your words. It is as simple as saying, "Father, I recognize how holy and just You truly are. I am but a simple servant in Your eyes. I am unworthy to be Your child. I have sinned against You and Heaven. Jesus Christ, I ask that you be mine. I ask the you fill my heart and my mind with You and Your love. Present me as a gift to God in You to be His. Thank you. I praise You for a new life." You are now God's. Find a church close to you. Find those who honor and love God in their lives and actions and learn to live God's way. I pray this finds you well and blesses you immeasurably. In Jesus' name I pray. Amen.